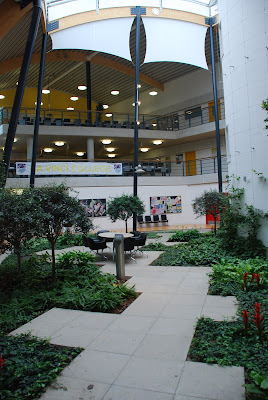 Visiting Leigh Technology Academy recently I really loved the two indoor 'garden' areas, each between two sets of Colleges. The academy is designed and operates strictly along the 'schools within schools' model. There are four colleges, each with their own Principal who operate and share one enclosed campus. Students and staff stay almost exclusively within their dedicated college areas apart from sharing specialist areas such as sports, technology etc. Those that know me are aware that I am a great fan of this model, having helped lead the change at Ministry level of one school into four small schools in the Cayman Islands. The benefits of this change were immediate and overwhelmingly positive in many ways. The planting certainly softened the environment and many people were convinced that the air quality was much better - probably an obvious statement but something we can learn from. Using the roof as a learning space - why not? Pizza - so why not education? Storage - why don't people listen?? Student art - don't you just love it!